The rectory building is named in honor of Our Lady of Fatima, who, in 1917, urgently requested prayers for Russia. Thanks to the contributions of mission society members, the rectory building now houses our priests and visitors. Unique by Russian standards, the rectory building is spacious with plenty of natural light. The building is adjacent to Most Holy Mother of God Catholic Church, and includes the priests’ living quarters and offices, a chapel, guest rooms, a kitchen and dining hall, bathrooms, a living room with balcony, meeting rooms, office space, and library/TV room. 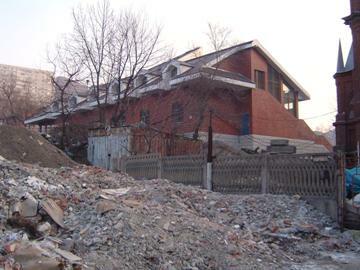 For most of the 15 years before the rectory was built, Fr. Myron and Fr. Dan lived in tiny rooms in the church building. Fr. Myron lived on the first floor, where most of the church offices were, and privacy was at a premium. Fr. Dan lived in a room next to the choir loft. The building’s plumbing and electricity were unreliable and all water for cooking and drinking had to be filtered and purified. Today, the priests live in the rectory building and are often joined by seminarians in their year of novitiate. Thus, the building also serves as a monastery as it houses the members of the Canons Regular of Jesus the Lord. 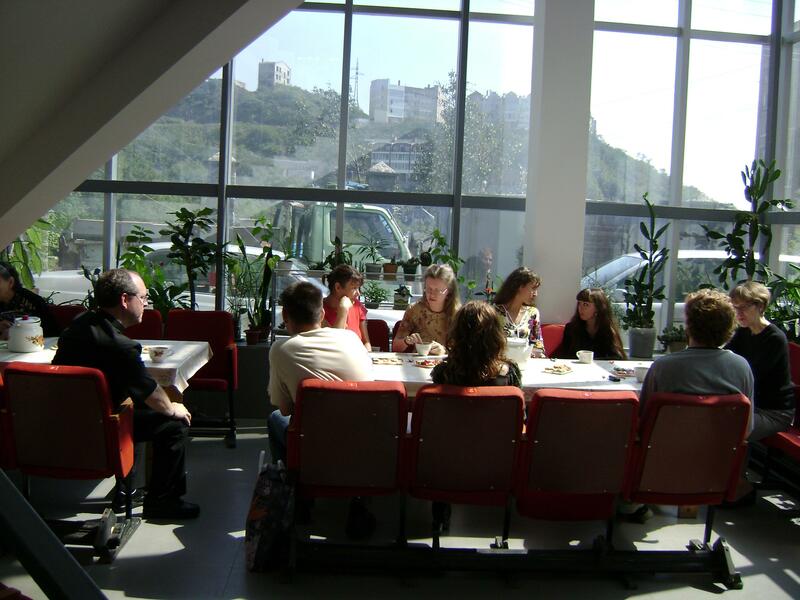 Mission teams typically stay in the building during their visits to Vladivostok. There are 7 bedrooms, some with individual bathrooms and some with shared bathrooms between them. Bedrooms are furnished with bunk beds and desks or tables. In the basement, there is also a washer and dryer. The large dining room is used from medium-large group meetings and can comfortably seat 35 people. 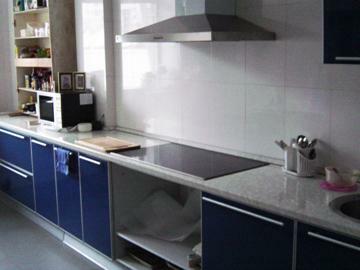 It is adjacent to the spacious kitchen and a large food storage closet. Unlike most modern Russian buildings with cramped, dark corridors, this building with its 3‑story atrium gives an impression of light and warmth and openness. 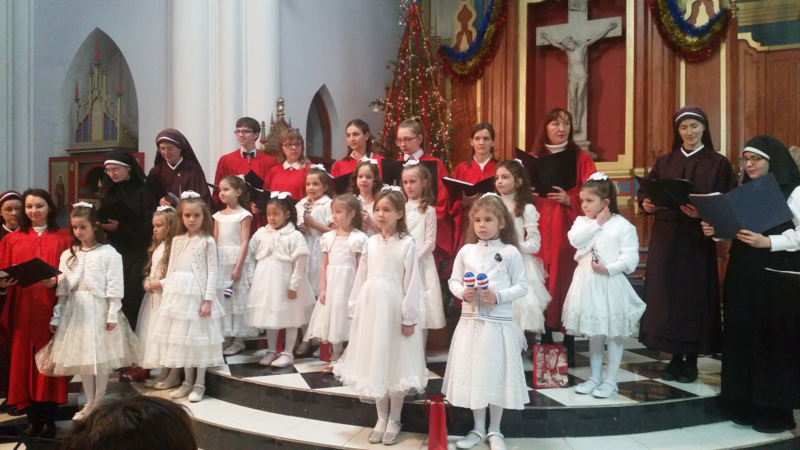 The area is often used for small receptions and for get-togethers after Sunday Mass. The space has plenty of windows and the natural light makes it an ideal place to grow plants. A view of the rectory building in January 2007. The church is to the right. Kitchen in the rectory building. The atrium allows space for parishioners to visit with members of a mission team after Sunday Mass. Fr. 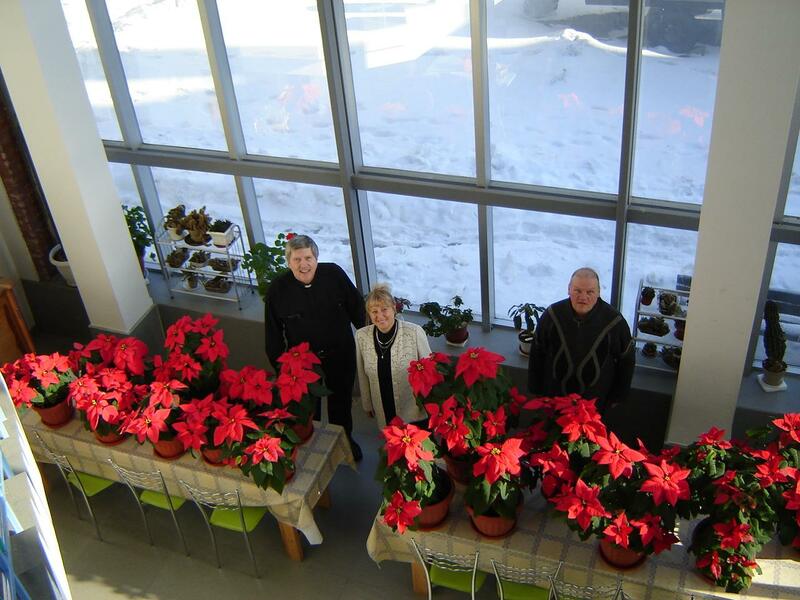 Dan and parishioners Tatiana Shapochnikova and Igor Lukin are standing in the atrium to show off the poinsettias they grew to adorn the church for Christmas 2012.